The second day of our Virtual Conversation ‘What is a recipe?’ has been very busy indeed, with contributions on Instagram and Twitter. Some clear themes started to emerge, and I take the opportunity of this post to draw them out. 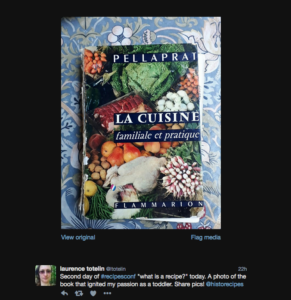 We opened the day by asking people to share photos of their favourite recipe books. Several of you tweeted pics of treasured family heirlooms: books with pressed flowers, stained recipe cards, well-thumbed volumes. Often these had been passed down the generations, usually from mother to daughter, but we also heard about some father-to-son transmission. There was a sense of nostalgia, but not of sadness, as we recalled past smells, tastes and gestures. Perhaps the written words of the recipe serve as proxy for all those other things that we find so difficult to express? 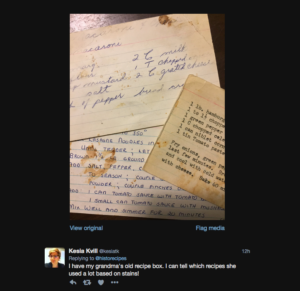 Through short recipes we remember family stories and traditions. Please continue to share your favourites with us over this month! Perhaps more strictly ‘historical’ was our question about ‘big stories’ in the transmission of recipes. We touched upon issues of class (Mrs Beeton and the rise of the middle classes); nationalism versus internationalism, and the link between recipes and empires; the importance of celebrity culture; and the prevalence of antidotes and panaceas in pharmacological recipe books. 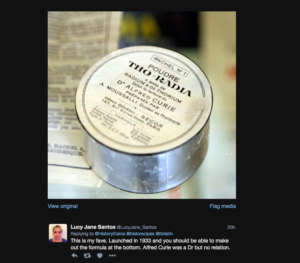 Celebrity endorsements, ancient and modern, seemed to strike a particular chord, especially endorsements for cosmetic products (Alfred Curie’s radium cosmetic powder anyone?). Lisa Smith asked whether the celebrity serves as a guarantor of efficacy or as an ingredient. I need to ponder that question further, but it raises the further question of ‘what counts as an ingredient’? Is skill an ingredient? I mean, without skill and embodied knowledge, a recipe can fall flat like bread without yeast. If so many contributors to the Recipes Project and its Virtual Conversation are able to recreate historical recipes, it is often because they are skilled cooks (and at times gardeners, because they need to grow rare herbs): they can fill in the blanks. And this leads us to the question of secrecy, which fleets in and out of focus in our conversation. What exactly constitutes secrecy in recipe transmission? We also touched upon literacy and grammar. I have often argued, following the anthropologist Jack Goody, that recipes are intimately linked to literacy and writing. Recipes, to me, are a written genre. Of course, recipes can be read aloud, and oral transmission of knowledge accompanies and complements recipes; but they remain texts. And as texts, they obey to specific grammatical and structural rules. We left the algorithms, knitting patterns, and musical scores a little behind today, but I hope we will get back to them in our future events. Do join the conversation in the coming weeks. Share photos, reminiscences, and asks questions to our community. You may find someone who knows that treasured recipe book, which you lost in that move years ago, as it happened today to one of our contributors. A lovely moment! Previous PostPrevious Day 2: What is a Recipe?